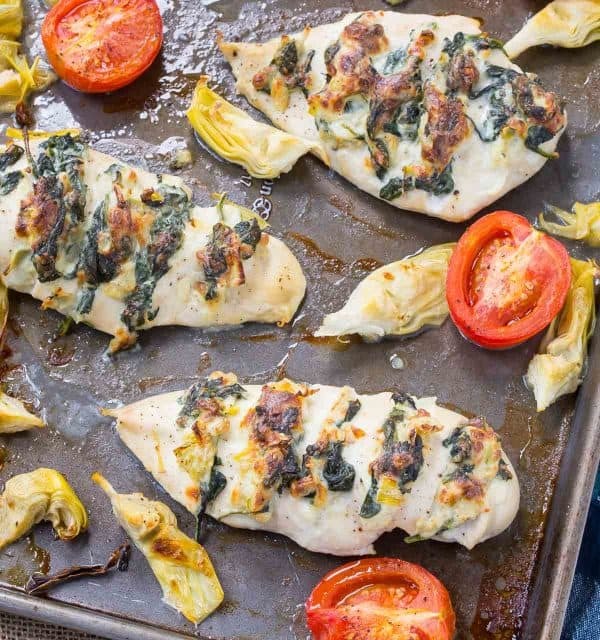 This Hasselback Chicken with Spinach and Artichoke might be your new favorite way to prepare chicken. 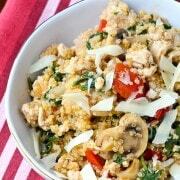 Rounded out with a few vegetables, this is a perfect weeknight meal! It’s definitely no secret that I love sheet pan dinners. It’s become clear that I am not alone in my obsession — my sheet pan apple gouda stuffed chicken breasts have become wildly popular…have you tried them yet? I mean, really, what is better than a meal prepared all on one pan? Easy clean up, very little attention required…it’s a dream come true. I made crispy chicken thighs with dijon and dill — complete with roasted green beans and radishes — they’re the easiest crispy chicken you’ll ever make. And these! This hasselback chicken might be my favorite chicken recipe yet. 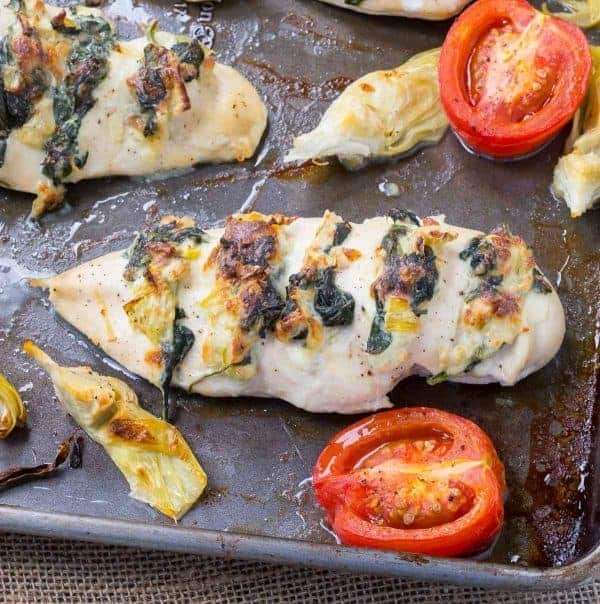 Check out that cheese, spinach and artichoke oozing out of that perfect chicken! I love making hasselback chicken because you get some of the filling with every bite you take. I partnered with Just BARE® chicken for this recipe, using one of their Boneless Skinless Chicken Breast Family Packs. I love the family packs more than anything, because I love leftovers! It’s the same reason I always buy big packs of chicken to grill. Night before: Prep chicken by cutting slits in it and wrapping it up and putting it in the fridge. Prep filling as well, cover bowl and stick in the fridge. Place artichoke hearts not used in filling in a zip-top bag…and put that in the fridge too. Day of: Place stuffing in chicken, bake! Or you could do it all the day of…it still won’t take long and dinner will be amaaaaazing. Why Hasselback? What does Hasselback mean? You may have heard of Hasselback potatoes, which are the most common recipe using a hasselback method. The potatoes are amazing because they get crispy edges and are still soft and tender on the inside. 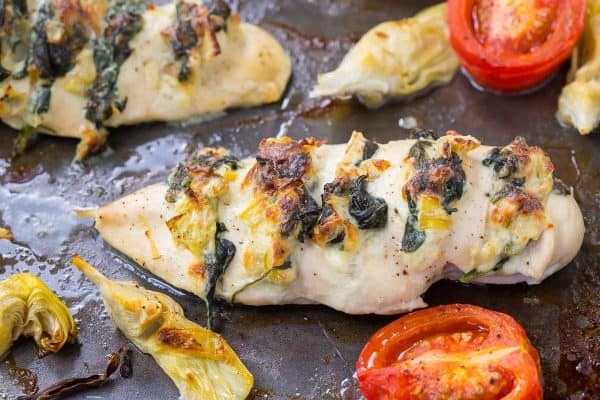 The reason I like the Hasselback method for this chicken is because it cooks quickly and you get a bite of the spinach artichoke throughout the whole chicken. It’s better than stuffing chicken in my opinion because it doesn’t all ooze out while it cooks. Plus, it’s super cool looking if you’re looking to impress someone! Don’t like tomatoes? Try this recipe with broccoli or bell peppers for some variety. It will be great will almost any veggie you have in your fridge! Tip: Want to make this into a great gluten-free or keto dinner? Try serving it with mashed cauliflower. Spread 1 teaspoon olive oil on a large sheet pan to prevent chicken from sticking. Set aside. Place a wooden spoon or chopsticks on either side of one chicken breast (on the long side) and make cuts across the chicken about 1/2 inch apart without cutting all the way through. The wooden spoons or chopsticks will help prevent you from cutting all the way through the chicken. Place chicken on prepared sheet pan. In a large skillet, heat 1 teaspoon olive oil over medium heat. Add onion and salt and pepper and cook, stirring, until translucent, or about five minutes. Chop 1/2 cup of the drained artichoke hearts and add those to the onions (reserve remaining artichoke hearts). Add the spinach and cover until wilted, stirring occasionally as needed. Once the spinach is wilted, add cream cheese, mozzarella cheese, and parmesan cheese. Stir until cheese melts and is combined. Remove from heat. Carefully place spinach mixture into each one of the slices you made in the chicken (I used a small spoon to help me and prevent burning my fingers. In a bowl or zip-top bag, combine the remaining artichoke hearts and halved roma tomatoes with one tablespoon olive oil until vegetables are coated. 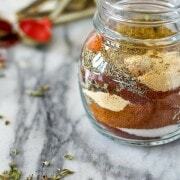 Arrange around chicken breasts in a single layer and sprinkle everything with pepper as desired. Bake for 15 minutes or until internal temperature of chicken registers at 165°F. Serve immediately. Husband’s take: He loved this! Changes I would make: NONE! I might throw some additional vegetables on if I had them but the chicken is PERFECT as is. If I do say so myself. Difficulty: Easy to moderate. The perk is that it looks fancy but it’s not that hard to make. Disclaimer: I have been compensated by Just BARE chicken for the time required to develop and share this recipe but all thoughts are my own, as always. Thanks for supporting my blog by reading about brands and products I use and love in my own kitchen. I love the flavors! It looks so simple to make, and I’m sure the whole family will love it. Looks so yummy, Rachel! I am following a low carb diet, so this to be added to my protein repertoire! thank you for sharing! 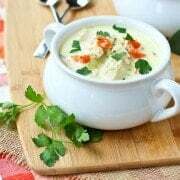 I am very conscious with my diet but i can’t ignore you recipe. Simply the best chicken with spinach. Love JBC. It’s the only kind I buy on a regular basis. SO GOOD! This looks so so good! I’m tempted to try it with feta cheese too! trimming chicken fat has to be one of the most disgusting kitchen jobs so I’m ALL for this! Love the idea of hasselbacking chicken like a potato! I love that this recipe is a little bit fancy, but super casual all at the same time! I’m always looking for new ways to spice up the ol’ chicken routine, and this is absolute perfection! Looks so delish! The one pan dinner is a life saver some nights!! looks good… Hasselback comes from the Hasselbacken restaurant in Stockholm where the Hasselback potatoes were created. Perfect flavor combo, can’t wait to make this! I ALWAYS use Just BARE Chicken. 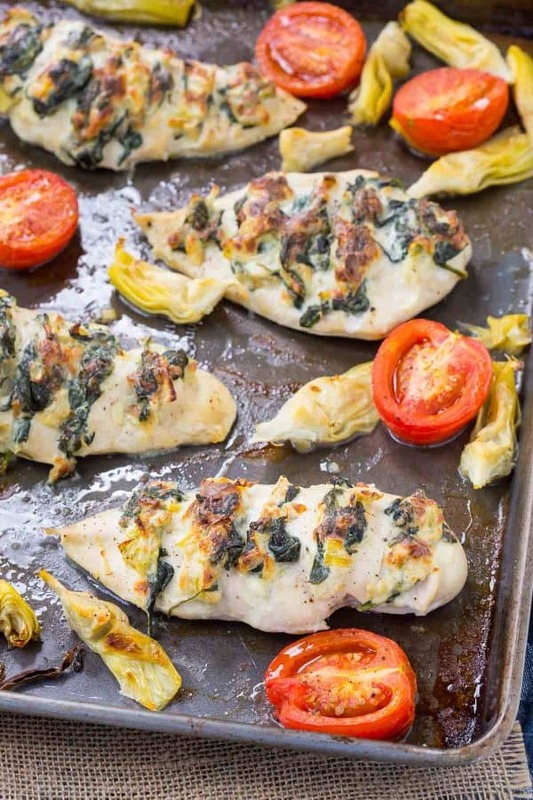 They’re the best and YOU’RE an absolute genius for creating spinach artichoke hasselback chicken. Need this ASAP, please! Hasselback CHICKEN?! How creative are you?! I love the Just BARE chicken – we eat it a lot in my house! The spinach and artichoke combo is BOMB.com. So my kinda dinner!